A recent study performed by a group of scientists led by Suckjoon Jun of the University of California at San Diego, and including Petra Levin, associate professor of biology at Washington University in St. Louis, found that rather than doubling in size every generation, each bacteria cell added the same volume (or mass; the term reflects the measurement technique). Crucially a cell that was small added the same volume as a cell that was large. Instead of examining populations of cells growing in a flask or test tube, the Jun group instead used a microfluidics device called a “mother machine” to follow hundreds of thousands of individual cells from birth to division. 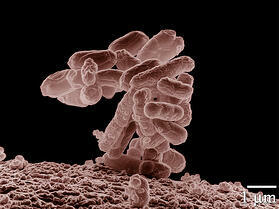 E. coli growing in a “mother machine” that lets scientists study the reproduction of individual bacteria. The machine consists of growth channels at right angles to a trench that is continually flushed with growth medium. How cells control their size and maintain size homeostasis is a fundamental open question. Cell-size homeostasis has been discussed in the context of two major paradigms: “sizer,” in which the cell actively monitors its size and triggers the cell cycle once it reaches a critical size, and “timer,” in which the cell attempts to grow for a specific amount of time before division. These paradigms, in conjunction with the “growth law” (which describes the way individual bacteria cells grow during the division cycle) and the quantitative bacterial cell-cycle model, inspired numerous theoretical models and experimental investigations, from growth to cell cycle and size control. However, experimental evidence involved difficult-to-verify assumptions or population-averaged data, which allowed different interpretations or limited conclusions. In particular, population-averaged data and correlations are inconclusive as the averaging process masks causal effects at the cellular level. In this work, we extended a microfluidic “mother machine” and monitored hundreds of thousands of Gram-negative Escherichia coli and Gram-positive Bacillus subtilis cells under a wide range of steady-state growth conditions. Our combined experimental results and quantitative analysis demonstrate that cells add a constant volume each generation, irrespective of their newborn sizes, conclusively supporting the so-called constant Δ model. This model was introduced for E. coli and recently revisited, but experimental evidence was limited to correlations. This “adder” principle quantitatively explains experimental data at both the population and single-cell levels, including the origin and the hierarchy of variability in the size-control mechanisms and how cells maintain size homeostasis. Universities like UC San Diego and Washington University, St. Louis spend large amounts of money to invest in the best research equipment to make discoveries like these new understandings in bacterial cell growth. In this case a simple microfluidic continuous culture device was developed in the Jun Lab at UCSD aka the "mother machine". This device ensures steady-state growth conditions in their experiments with cell growth. This high level research would have been next to impossible without this machine. There is a vast need for cutting edge laboratory equipment in university research. Biotechnology Calendar, Inc. creates an avenue for laboratory product vendors to meet face to face with top scientists at leading research universities around the nation. Discoveries like these lead to a better understanding of cancer, bacteria, and cell growth, which in turn improves the standard of living. To present your lab equipment to top funded research institutions like UCSD and WashU, and to make your mark on cutting edge life science research click below.